There are very few breaks a "gifted kid" will get south of the Rio Grande. The dearth of lending libraries is only matched by the almost total absence of programs for a square-shaped kid that will not fit in the round hole in the one-size-fits-all-(or-else) educational systems available. Carla Gomez Monroy reported about a child in Arahuay that "[was] categorized by the teachers as [a child] with bad behavior...". The teacher would set this child "apart from the group, at a desk for himself, closer to the teacher". But then, "the first day A... came to school with his XO laptop, instead of playing during recess, he kept on exploring the XO. He quickly became one of the most acquainted with it and empowered to help his classmates by telling them how to do this or that." The clincher comes when "even his teacher would ask him how to do certain things that he had already mastered." A very similar story is shared by Ivan Krstić, likely about the same child. Most of us teachers over there don't really know how to deal with this kind of "problem" kids. These do not pay attention, they often fight, bully or are bullied... Yet, very often the real problem with them is that they are too bright for their own good. They might well be brighter than the teacher, but not wise enough to keep pretend. They get bored with endless explanations of material the other kids don't understand. They are able to read by the time their classmates are still challenged by the alphabet. Bored, they don't pay attention, they do not answer because their minds were long gone elsewhere. Their grades slip, they might even quit trying and drop out. They might eventually succeed in business if thus blessed, or just end up depressed and basically unemployable. Most Ministry of Education budgets there barely have anything for Special Needs kids. Some disabilities might get a bit of funding, sometimes through international aid, but I have never seen an official program for gifted kids outside of the developed countries, except maybe those very same d.c. offering scholarships to get them to emigrate. I will bet you a home-made pizza for your Happy Meal that the kid in those stories (thank you, Ivan, for not posting his name, APSP) has a pretty good IQ. He definitely is "a natural" when it comes to computers. He might even carry a bit of ADD. In the conventional school setting he is a "problem kid". Different, he simply will not fit in the spot that had been dutifully prepared for him by the Matrix, uh, the bureaucrats in Lima. Not that he doesn't want to, he's probably had enough spankings already, but he just can't. Teacher's kindness might try some special accommodation, maybe have him do small chores just to help him stay out of trouble. More likely than not, he will be bullied into submission, maybe by those student-monitors appointed to fill the gap now that teachers cannot mete physical punishment. Enter the OLPC. This kid, for the first and maybe only time in his life, is getting a break in school. I dare say that much more than to the rest of his classmates, the XO is a life-changing success - for him and those like him. I see the XO in its present incarnation as having its best market among this population. This kid's behavior change seems to indicate that the problem was not with him or in him - but rather with what he was getting in the pre-XO school. Please forgive me the heresy to say that for most of the other kids the XO has still to prove itself beyond a nice entertaining gizmo, yet for this one, it is opening new, bright prospects. It does worry me, though; some reported policies of well meaning teachers that will only let kids that complete "work" use their XO. This kid is not yet "safe" from such carrot-and-stick methods. He most likely will get in trouble again and again under the memorization model that is the bane of many of'uns educational systems. It would be night tragic that this kid, who finally is getting ahead in something, lost the very chance he has to have his giftings flourish. But I digress. Mario Vargas Llosa, Peruvian novelist, has one of his characters in "La Tia Julia y el Escribidor" wish to go overseas to study Air & Space Engineering. His father confronts him, "what will you do when you come back to Peru, build kites?" So I wonder what will happen with this kid when he grows older. Unless the OLPC or other projects provide content, there aren't that many options for him within the current situation. He'll probably end up emigrating, at least to Lima like zillions of those who want to further their education. He certainly will have to work from a young age, and pay his own way, not that many people in Arahuay can pay for a child's college. Yet hopefully he will have his eyes open to wider ideas and possibilities, and who knows, he might become that Peruvian George Lucas or Steve Jobs that they tell us the OLPC will produce by the truckload. I rather doubt the OLPC will have that much of an impact in the rest of Arahuay, but we can hope for the best that it will also, especially if improved in content. Some of us share the story of a man throwing starfish back into the sea, as an example of how we should do our best even if we cannot help every single one. We should do what we can, wherever we are, with what we have. 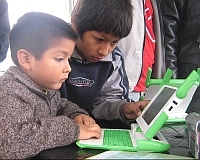 Thus in Darkest Peru, a kid is given a chance, thanks to the OLPC and you all. Yamandú was teacher in several countries for over 15 years and wrote a book on Uruguayan Education. Too true. I almost failed third grade because I could spell. So I didn't do the homework, and got zero on Monday through Thursday. Averaging that with the 100 on the test on Friday gave me a grade of 20 for the week. At this point in the tale, my mother told me many years later, the teacher turned bright red and shut up, and my mother decided it was time to get me into another school. If he studied rocket science then he would have to leave home to find work. If he studies programming then there will be real work he can do from the top of a mountain in darkest Peru. Internet connectivity there may well always be five years behind that in the big city but that will be better than we have now and it will be good enough for him to do useful work if he really wants to stay home. If he decides to roam then comms will be good enough that he can still stay in touch with home and continue to work with them from far away. Don't get trapped into assuming the future will be just like the past but more so. Some things will change fast, others hardly at all. Watch for things that exhibit exponential growth (e.g. where growth now will cause greater growth later). In recent years exponential growth has applied to comms speeds and hardware capabilities and will continue to do so. Free software, free culture, open learning resources may also show exponential growth (because it is available for all to work on so the more there is the faster it grows). Remember the characteristic of exponential growth is that at the start it seems slow but it gets faster and faster and faster. This is what has made me excited about OLPC from the beginning. Giving resources to the exceptional among us. I remember Tommy Hersh and I hacking at TRS 80's in the back of the classroom, the only thing that kept me from escaping boredom by reading three books a day and Tommy from bouncing off walls with pent up energy. He went on to design airplanes, I to implement software systems. If not for technology to "save" those of us thinking faster than the class, a whole generation of gifted students in America would be lost. Thank you, Yama, for a most interesting and perceptive post, which well displays your intellect and experience in education. It provides a refutation of the original mission statement of OLPC, which I paraphrase as follows: "to provide a tool which allows children to educate themselves without further involvement of their educational system". As we can now see, this statement might be made more accurate by inserting the words "some exceptional" before "children". I have no doubt that a huge proportion of those reading this blog were exceptional children (see Ed Cherlin's post), as was I and, no doubt, Nick Negroponte. MIT is full of such people. It's far too easy to fall into the trap of thinking of yourself as the model for everyone - I have heard fellow computer geeks proclaim enthusiastically that the whole purpose of OLPC was to allow that one special child among millions to emerge to greatness. This begs the question of "what about the rest of them?" Educational systems must work for all kids, not just the special ones. There is a vast amount of work remaining to be done by Yama and her cohorts, supported by all of us, in order to realize the potential of the XO and similar computers. Just because OLPC shouted "can do!" and put together an artifact occupying the lowest rung of Kay's hierarchy (see below) does not mean that the task is done and that what remains is to convince stupid bureaucrats to buy XOs in large quantities. The work is just starting. Thank ya'll for your kind posts. To more serious matters. One thing that us geeks often get blamed for is that we seem to assume anyone - /if they just simply used their brains, for crying out loud/ - could do what we do. Took me well into my 30s to realize I am an awfully special guy in that department, and the others just ain't. And even more years to be kind to those who just can't do it as well and fast as I. Thus my current crusade in the Educators laptop.org list for usability awareness in the OLPC experience. That is because the teachers are those who will make or break whatever is the XO role to what Lee very accurately points out: the rest of the kids. I think that it is there that the next big jump will happen, when _finally_ end users start building the OLPC thing. I wish, I hope, I pray you are right. In 10 years?. All current evidence I have, both my personal life and what I have seen, point to such a change not happening until maybe this XO child generation takes over. Many reasons. Even if a T3 makes it to my friends that are translating FOSS into Aymara in the main University in La Paz, Bolivia, their hottest of 3 machines is an 800 Mhz that I gave one of them last time I was there. They have to work full time, besides being full time students. They are so shackled down by the fringe disadvantages of being born Bolivians that it is just not right, and not comparable to our opportunities here. This is one more reason why I am grateful, to you, Joe, and to all these folks. Ya'll don't _need_ to be doing this. You are doing it for those who can't do it now by themselves, helping them so eventually they will be able to use the gifts they were born with, geeks and muggles alike :-). That is a Good Thing. I am embarrassed to find that I have assumed the wrong gender for Yama. I was applying slavic language rules to his name (without enough evidence) and had associated his name with a completely different post's photograph of its female author. I plead old age dementia. At only 4 hours of Lima, Arahuay seems to be farther of the biggest city of the country. From the time of the grandparents it is a small rural village, but today, for his grandsons, the life has started changing. And it is that the Department of Education chose Arahuay to try the program a laptop for child. Jennifer: The laptop has several programs, has Internet, has photos and has camera. (NAPA): Had you already Internet and computers here? The first computers came to the village during the past government, that brought Internet to many schools in the country, with the Huascarán plan. But they were for the high school pupils. Now, the purchase of 40 000 laptops designed by the USA Foundation " one laptop per child ", will allow rural zones children to share the discovery, advanced this year to the boys of Arahuay. Yasmira: My cousin went to the computers, but I never went because I didn’t know. She knew everything, but I was not learning. And now I know how to use it, upside-down. The first day, came some men, they told us how to use it, how to turn it on, how to change. They stayed with us fifteen days, and then went away but we already had learned. The twin and their older brother, live in the shelter that the director has constructed for the boys of remote communities. They stay all week in Arahuay, to attend school. Yondi and Denis are the ones who use these machines better, because they do team work. Yondi: Because we helped one another, and we are three brothers. If I don’t understand something, my brothers teaches me how to do it. (NAPA): What happened to your antenna? Yordi: it broke because I fell off the stairs. 50 children are the temporary owners of the laptops, and take them home, so all family can learn. Sarita: My mother stays there, and also knows, but just a little. (NAPA): And what do you think about it? Mother of Sarita: Pretty to write like this. The parents see computers as a new game, but teachers know it is a game that educates. Teacher: It is very important, what thing? our nature no? to conserve our means.... atmosphere (the boys respond jointly) and now we are going to take photos to our plants, those that offer oxygen to us. The technicians of the Ministry of Education left the teachers a list of useful Web pages for the natural sciences and environment classes. (NAPA): what do you use it in school? Yordi: In order to learn, mathematics, science, we write in science. Sometimes we get homework in the computer. Sarita: The laptop is very good and is very useful to study at home. A limitation for a maximum advantage of them is that batteries only last two hours, and electricity in town not always allows to recharge them. In addition, the Internet connection also fails a lot. (NAPA): what is that for? Sarita: For the Internet, when there is Internet, right now there is no Internet. Sarita’s friend: See... check if Internet already arrived! The director of the school tells us that the students arrive now at school more motivated, there is less absences, they participate more in class, and not only they sit to listen but they investigate for themselves. For the government the pilot program has fulfilled its objectives, and this week has distributed 45 more laptops, in the town of La Jota, in Tumbes, as part of the 40 thousands that will be distribute next year. Million of soles invested, that will have to demonstrate to be part of an integral plan. A plan that must include teachers, that also need technology and qualification to take advantage of it, and mainly results in learning and a more fun and efficient education. I'm finding that my XO really reaches out to the kids that would be called gifted or disabled, depending on who you talk to. You know, the ADD kids that can't/won't sit still because they are too curious about everything in their world. I was one of those, but I learned to shut up and write in journals instead of bouncing off the walls. So far, I have been amazed at the skills of my one of my boys -- probably ADD, absolutely no filters so he says and does whatever comes to mind, can't hold himself still in a classroom. You know the "type." And unfortunately, so does everyone else and most think he's a problem. He and the XO rock. He's been busy doing interviews with the teachers on "record" -- a sophisticated language skill, I might add. He hates to write but will write spelling words on the XO. He has, and I quote "mad computer skillz." He will obsessively try to beat ANYTHING on GCompris. I want to try to get him to blog -- if not with words, then with pictures. He has a really valid world and has no way of connecting what he loves to what he is learning. I'm working on that. I've also been playing a lot of pokemon and yugi-oh with him. A kid doing math way below grade level is adding and subtracting 2 - 4 digit numbers for these games. (On paper, he can handle 1 digit numbers and a few 2 digits). He's reading the cards. Learning to use a number line. Learning about decimals and place value even... Holding a card up to the camera on the XO and telling about it. Pokemon and YugiOH aren't OLPC, but they are very much in the idea of giving the child something to explore instead of something to learn. Next week, it all changes and I'm supposed to do "serious work" with him. I can't help but think he's going to be Anderson Cooper the way he likes to interview people and I am dreading next week. A lot. Glad the XO is portable enough that I can sneak it into the classroom with me. Every kid I know can use a computer to entertain him or herself -- even some of the most disabled kids. But few can use it as a tool. That's the XO's real magic. Oh, and I wanted to add that for me, the XO is working for kids who, to use language from the post, are still struggling with the alphabet while their peers can already read -- in short, the kids behind their classmates. I'm finding a child doesn't have to be a misunderstood genius or smarter than the teacher for the XO to have that affect on him/her. It's really playing to the strengths of some intellectually-disabled kids I know.